C◦mp◦se :: Conference, Thursday, May 18, 2017. See also the PDF version, and the PDF handout. 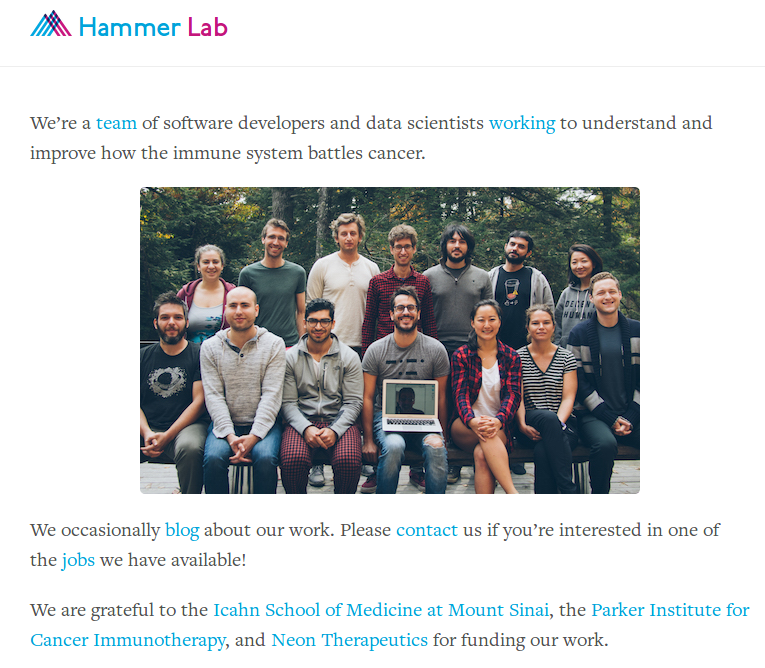 Seb: Software Engineering / Dev Ops at the Hammer Lab. Ketrew: a workflow engine for complex computational pipelines. 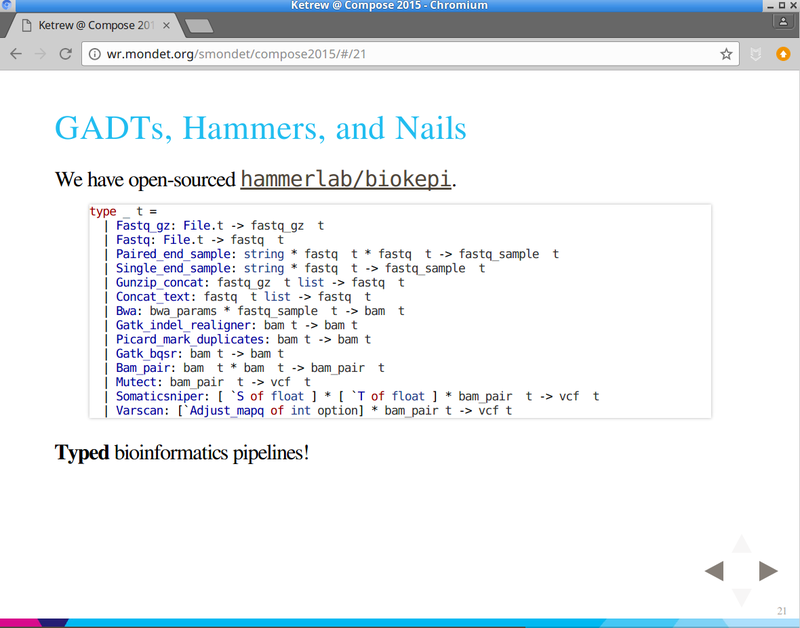 Biokepi: a library of Ketrew “nodes” for Bioinformatics. Used with GCloud/Kubernetes, AWS, YARN (incl. Spark). 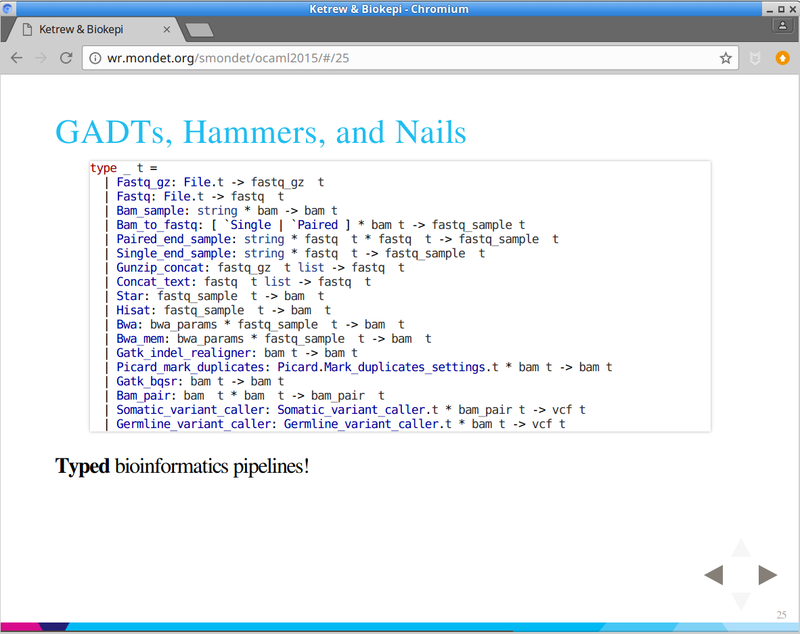 Cool experiment: GADT-based, very high-level pipeline EDSL. 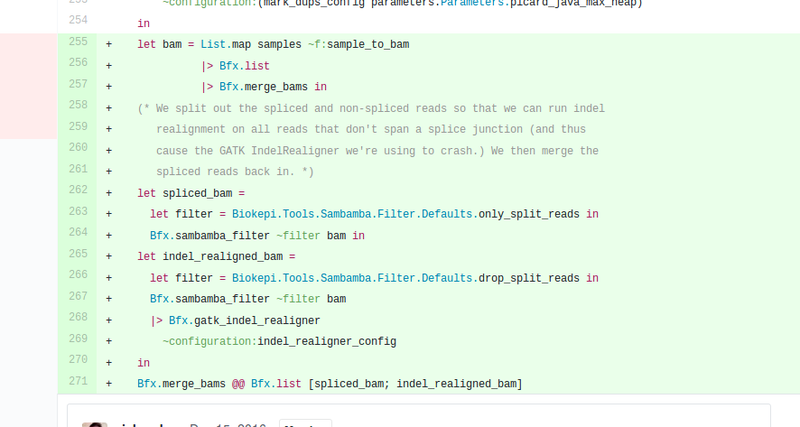 Still missing proper lambda/apply, list functions, etc. Adding new types is pretty annoying. Optimization passes need to deal with whole language at once, always. Optimization are not proper language transformations. Presenting “QueΛ”, first just some .tar.gz and draft paper; then it got to PEPM'16 → DOI:2847538.2847542). It uses modules and the EDSL is well typed. 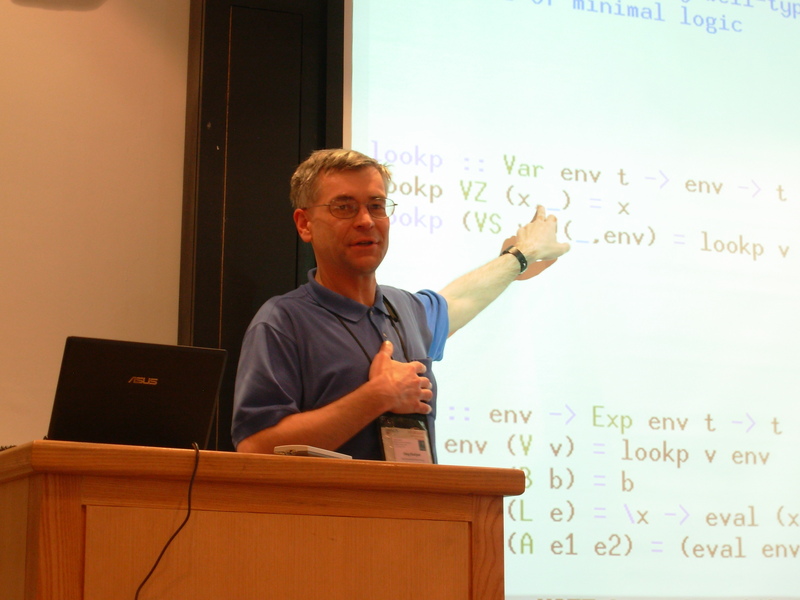 In Haskell (very concise code, very un-modular). ⇒ Follow the course; with QueΛ's help; in a Biokepi-like setting. Show how to manipulate the pseudo-AST. 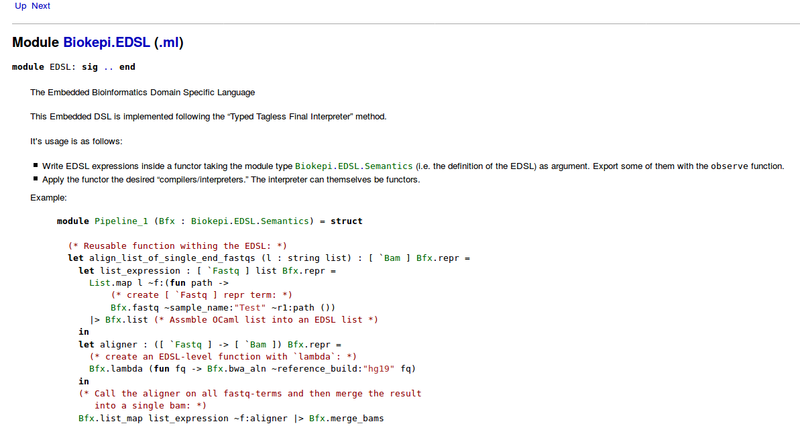 Show how to extend the EDSL. 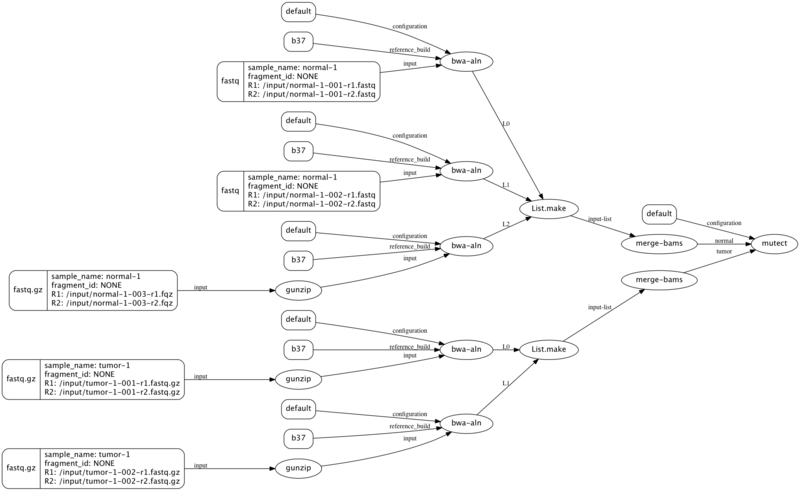 Some type-hackery later … A Generic Extensible Optimization Pass Generator. Printf.printf "Ex2 normal: %s\nEx2 optimized: %s\n%!" In our application, it's mostly for display/readability purposes. Custom “saving” of important artifacts. Applying functors, while conceptually simple, scares beginners. Though they can → PR #429. Losing type variance because of the optimization framework. And in our case optimization framework is useful only for display. Cannot always use sub-modules because of include.